It seemed as if the European Beer Challenge on Beer O'Clock Australia was winding down to a close. It appeared that the few remaining countries would prove elusive, but I had other plans! Coming to you live from Tbilisi, Georgia here is the European Beer Challenge! Georgia, not to be confused with the U.S. state of the same name, is a small Eastern European/Asian country in the Caucasus mountain ranges. It's one of the most beautiful countries I have ever been to, with stunning natural scenery in abundance. Tbilisi itself is an odd place where extreme poverty meets extreme wealth but is a still an excellent tourist destination. I knew very little about Georgian beer other than there were many of them! This beer was very refreshing to say the least. It'd been a hot day in Tbilisi with a lot of walking involved when I sampled this and it certainly did not disappoint! The beer was almost brand new, only 8 days from bottling date to drinking, and that freshness really came through in the flavour. The malts were unusual sweet and spicy at the same time, but the grassy hop bitterness cut through nicely and almost overpowered them. I picked Mtieli to review, over it's big brother Natakhtari and others, because I thought it best encapsulated what Georgian beer was about. Georgian's drink their beer out of national pride, but almost all will readily offer that German beer is better, without prompting, in the same sentence. 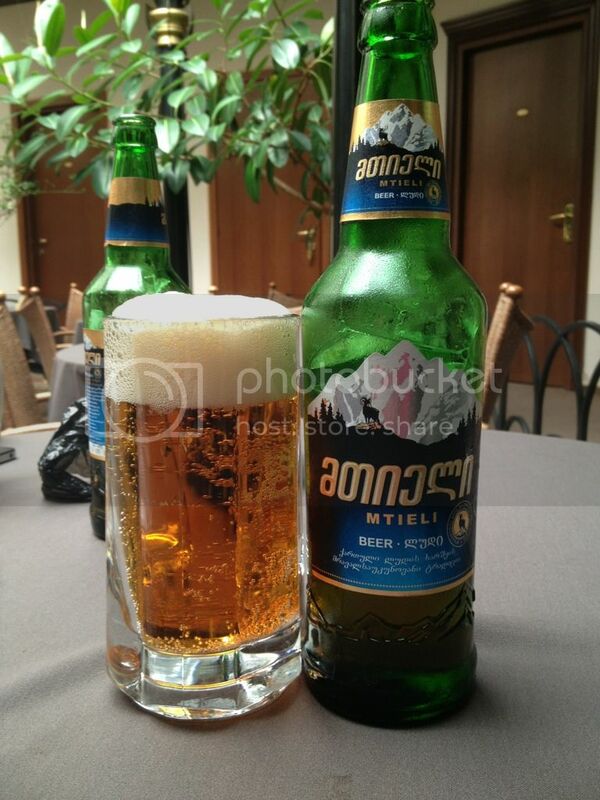 Georgian beer is undeniably cheap (you can easily get 2 beers for 1 Euro), but this doesn't mean it has to be bad. Mtieli (pronouced M-teal-ay) was not over carbonated, unlike a number of other Georgian lagers, and really stood out from the crowd.